Musical Chairs: How Often Are Players Hitting Free Agency Finding New Homes? One of the peak moments in the NFL offseason is the start of the new league year. Players hit the open market and are allowed to talk to new teams about a potential partnership. Players get new deals, and franchises are able to fill needs with proven veterans, some of which may be entering the prime of their career. While many of those contracts are smoke and mirrors with the big number that players never receive, there has been a noticeable and obvious trend unfolding in free agency throughout the last few years. Even with the salary cap consistently rising each year, franchises cannot afford to keep every player they would like, especially considering other teams can outbid them. Every team manages the cap differently as some franchises frontload contracts, others backload most of their more lucrative contracts, and several clubs utilize a mix of both strategies to stay under the cap. Regardless of a team’s strategy, they are still unlikely to keep some of their premier players who hit the open market. 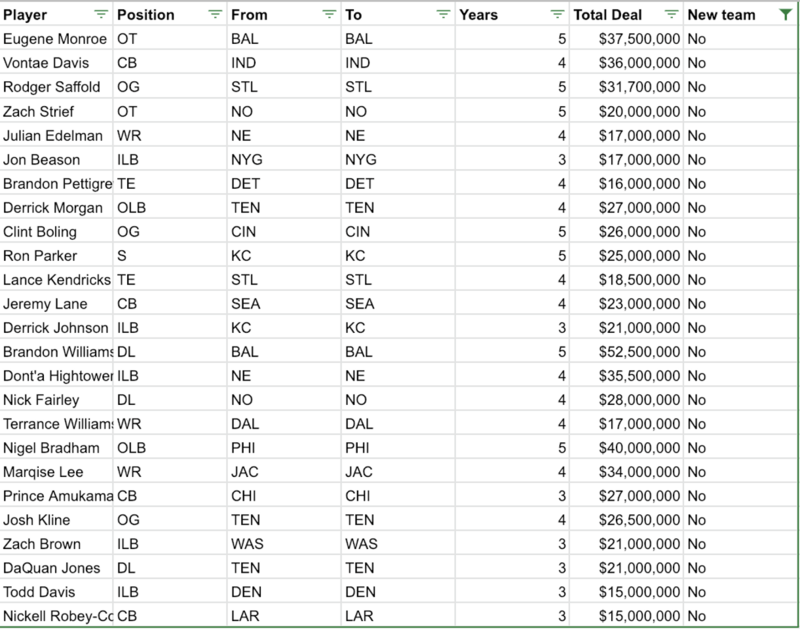 In the last five free agent classes, 234 players signed deals of $15 million or more. 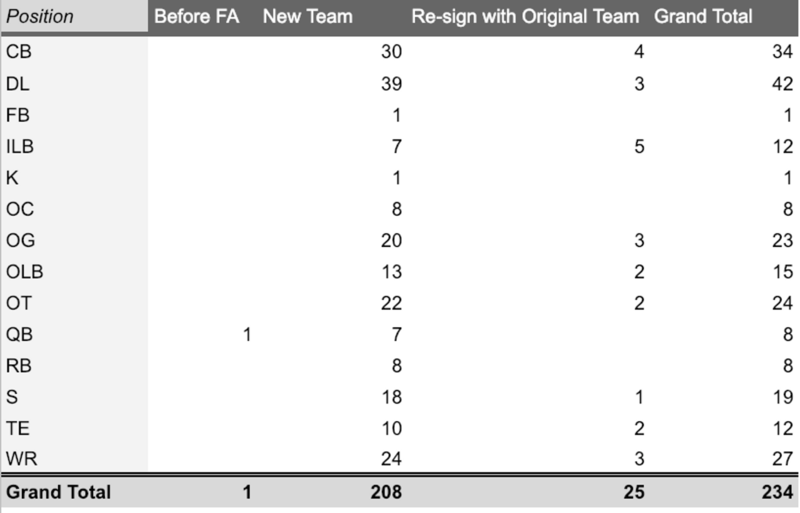 While each deal varies with guarantees and total years on their contract, the trend of players joining new teams is abundantly clear. Only 25 players who tested the open market and signed $15 million plus deals stayed with their previous team. During the 2018 offseason, New Orleans quarterback Drew Brees signed a deal with the Saints right before the new league year begun, which makes him an outlier. Another interesting case was Rodger Saffold in 2014. Saffold was a free agent and signed a reported five-year $42.5 million deal with the Oakland Raiders. However, Saffold returned to the Rams after failing his physical and losing his deal with Oakland. He agreed to a lesser deal with his previous team despite having signed a deal with a new team. 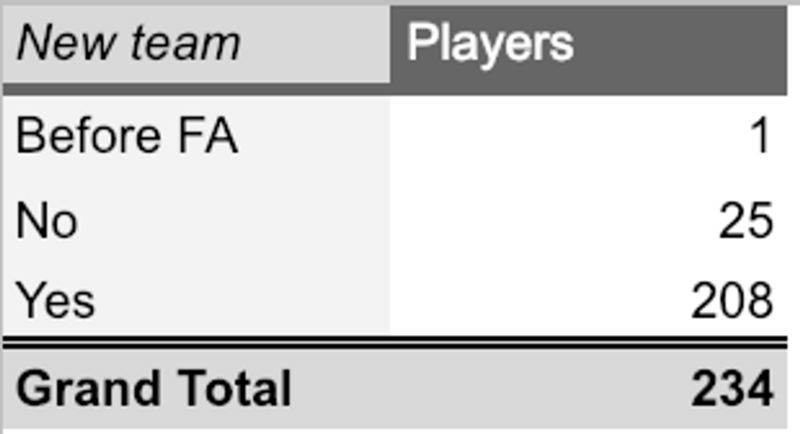 Saffold was counted in the 25 players, but it should be noted that he was extremely close to joining the majority. When analyzing the 208 $15 million plus contracts signed in free agency over the last five years, there are a couple of other noteworthy trends to assess. Five out of twelve inside linebackers eligible in this sample size re-signed with their previous team, which is nearly 42%. That percentage of staying ‘home,’ is an outlier compared to the rest of the data. There are several different factors that could be at play, but the most obvious answer is that with more teams playing in nickel and dime personnel to counter the rise of the ‘11’ personnel, inside linebackers are not as valuable as they once were. 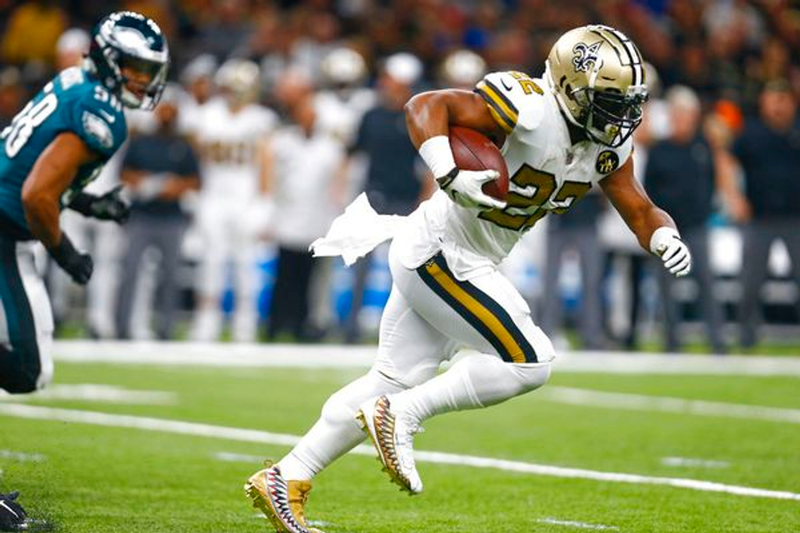 Another potential solution could be the evolution of the inside linebacker position, where the old prototypical inside linebacker is being replaced by the modern, new age hybrid linebacker. On the contrary, seemingly every other position is seeing a much different result. Offensive linemen re-signing with their previous team is rare, especially if that lineman is considered above the league average at their respective position. The need for quality defensive backs to counter the league’s pass-happy approach has also driven the market up in that position group as well. On the other side of the ball, wide receivers are being paid handsomely to play elsewhere. In the 2018 offseason, Taylor Gabriel, Paul Richardson Jr., Donte Moncrief, Albert Wilson, and Sammy Watkins among others got well above what they were expected to get. 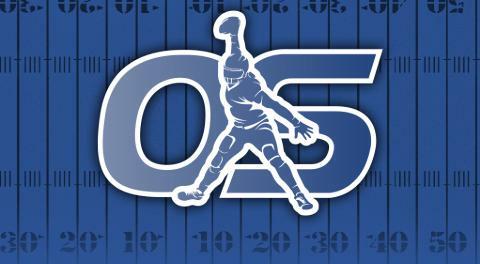 The wide receiver market was drastically altered last March as a direct result of those deals. The seemingly scary part about this trend is how it does not appear to be going away anytime soon. Like previously stated, with the salary cap only continuing to rise compounded with rollovers, teams are going to be able to throw money at any player they wish to sign. Unless players begin to take less money to go to a specific team, each positional market is only going to continue to rise, and teams will continue to lose players in free agency. However, the solution is something that many teams have already begun doing. Instead of letting players hit free agency and testing the market, signing players prior to their contract years is the best counter. By signing a player earlier in their NFL careers, teams will be able to get a better price while also retaining that player for a more extended period. The most recent example occurred with the Baltimore Ravens and Tavon Young. A fourth-round draft pick who was entering his fourth season in the NFL. Baltimore signed him to a three-year contract extension reportedly worth $25.8 million. While that price may seem high for a nickel cornerback, the market for an up and coming cornerback set to hit his prime would be through the roof in free agency. An even better example would be with the Minnesota Vikings in 2018. During the offseason, they signed Eric Kendricks, Stefon Diggs, and Danielle Hunter to contract extensions. Instead of letting those players hit the open market and likely lose a bidding war, Minnesota locked up a couple of valuable players for the next few seasons. NFL contracts could take a drastic turn once the latest CBA expires, but teams should adopt the model of re-signing players earlier rather than later in the current market.